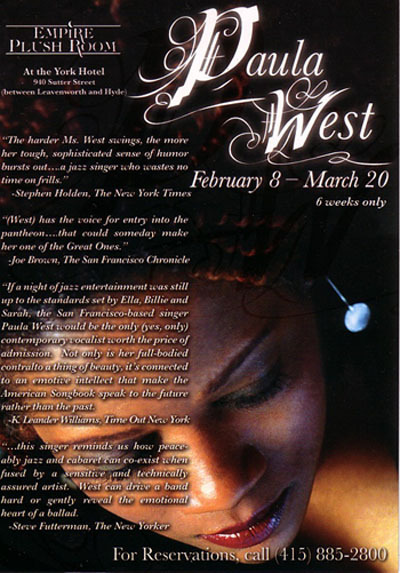 Paula West returns to the Plush Room following her fourth consecutive year at New York’s Oak Room at the Algonquin Hotel, Jazz at Lincoln Center and her debut at the Blue Note. This six-week engagement will feature three noteworthy jazz trios comprised of three of the best jazz pianists performing today. Returning to open the run will be Eric Reed, who most frequently works with Paula and whom the New York Times calls “a rare combination of assiduous writer/arranger and fast thinking improviser.” Week three brings back Grammy-nominated pianist/producer Bruce Barth, whom Downbeat Magazine says “…is self-assured and full of ideas” and “…digs deep to his true soul in the keyboard language.” The fourth week, Blue Note recording artist, Bill Charlap will make his debut at the Plush Room following the Grammy nomination of his latest recording, “Somewhere: Songs of Leonard Bernstein.” Eric Reed returns for the final two weeks of the 2005 run. First call side musicians performing with these piano greats include bassists Ray Drummond and Gerald Cannon, and drummers Joe Farnsworth, Rodney Green, and Ulysses Owens. This new show will run only six weeks. Enjoy an evening of romance, swing and humor at the Empire Plush Room. Show and ticket information is available on the Empire Plush Room website. This entry was posted on Tuesday, January 25th, 2005 at 8:04 am. It is filed under Music News/Info. You can follow any responses to this entry through the RSS 2.0 feed.